Théodore Géricault (1791–1824) would almost certainly have slipped into obscurity were it not for one vast narrative painting: The Raft of the Medusa (1818-19). Telling the horrific and scandal-ridden story of disaster at sea, it became an immediate celebrity, and even its tragic deterioration (due to his extensive use of asphalt) has not lessened its popularity in the Louvre. In 1816, France was a nation in turmoil. Crushed militarily at the Battle of Waterloo the previous year, Napoleon’s empire had collapsed, and the rest of Europe had restored the rule of Louis XVIII, reverted the country’s boundaries to those of 1789, and were occupying the country until it paid a war indemnity. In June 1816, the French Naval frigate Méduse (Medusa) sailed as the lead of a small group to accept the return of French Senegal from the British, as part of the peace process. She was under the command of Viscount de Chaumereys, who had had little experience at sea over the previous twenty years, but had been preferred under political policy. The Méduse overtook the other ships instead of sailing in company, and poor navigation (attributed to the captain) took it more than 100 miles off course, to run aground on a sandbank off the coast of West Africa on 2 July. The decision to abandon the vessel was taken on 5 July, but with 400 souls on board and capacity for only around 250 in the ship’s boats, at least 146 men and one woman were put on board a raft which was built hastily for the purpose. Although the ship’s boats had originally intended to tow the overloaded and partially-submerged raft, it was cut loose after only a few miles. The survivors on the raft then had little to keep them alive: a bag of ship’s biscuits (eaten on the first day), two barrels of water (soon lost overboard), and six of wine (hardly suitable to prevent dehydration). Over the following 13 days, most died or were killed, leaving just 15 alive when they were spotted by the Argus, a brig from the same group bound for Senegal. Some of the survivors wrote a detailed account which was published in 1817, and deepened the embarrassment caused to the newly-restored French monarchy. What should have been a routine step in restoring a French colony became a lasting matter of shame in the press and public debate. 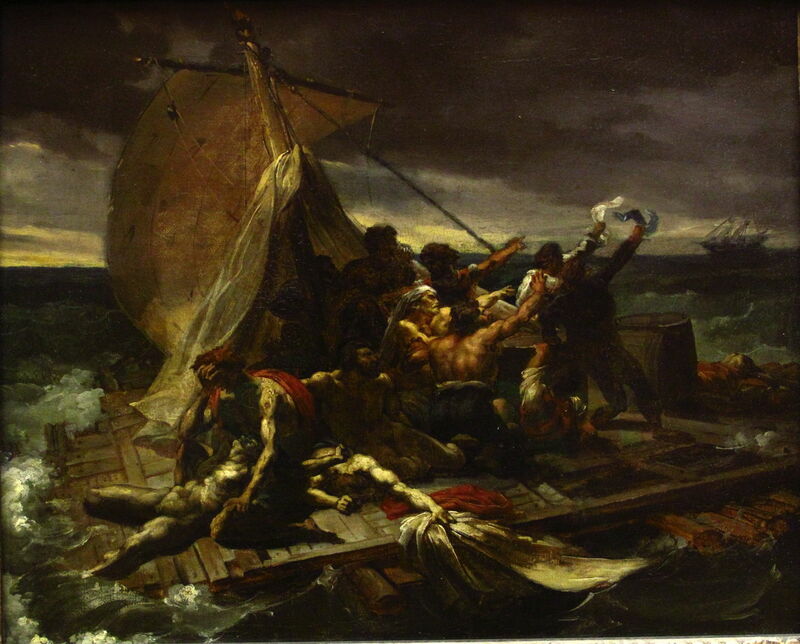 In the winter of 1817-18, when Géricault must have decided to paint this disaster, he would have recognised the two changes of fortune (moments of peripeteia) in the story: the abandonment of the Méduse, and the rescue of the few survivors remaining in the raft. Classically, the best depictions of shipwreck and rescue have chosen the latter as preferable, as it shows both the result of the gruelling period of survival and the imminent hope of being saved. Géricault may also have considered this an opportune parallel with that time in the history of his nation. During the spring and summer of 1818, Géricault worked on accumulating the information which he needed for the painting. He spent a long time talking to survivors, notably Savigny and Corréard, the principal authors of the book about the incident, and studied popular lithographs which were being produced illustrating it. Of the three example illustrations included in Eitner’s monograph, one showed the abandonment, one a mutiny on board the raft, and the last the sighting of the rescue ship. 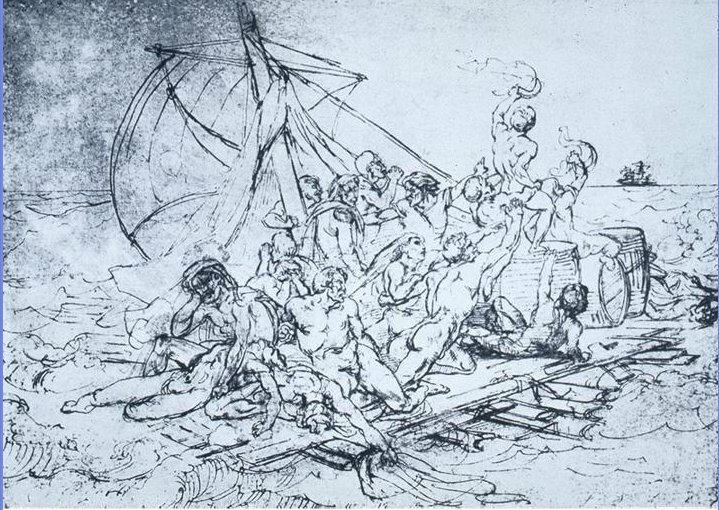 Jean Louis Théodore Géricault (1791–1824), Sketch for The Raft of the Medusa, Survivors Hailing a Rowing Boat (undated), ink on paper, 24 x 33 cm, Musée du Louvre, Paris. Wikimedia Commons. He sketched various moments during the disaster, gradually honing in on the moment of rescue. 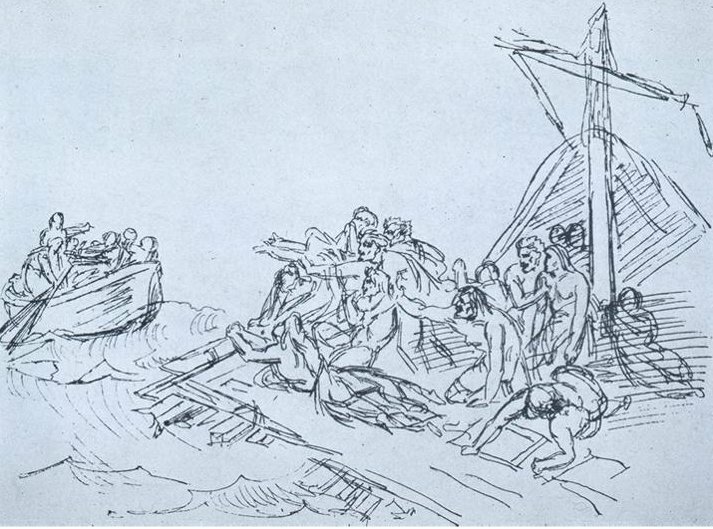 This drawing shows one of the ship’s boats from the Argus reaching the raft, for example, and Géricault drew each event from the mutiny through to the raft being left empty once everyone had been rescued. 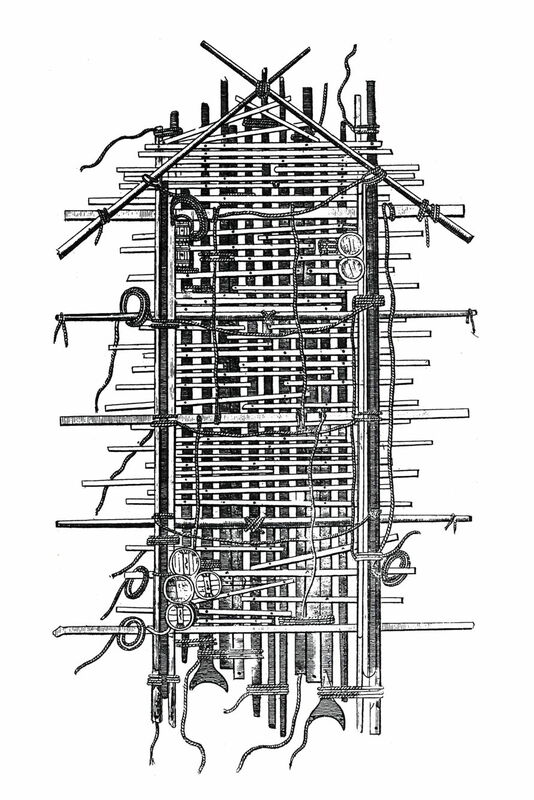 Note that in this sketch, the raft is shown as a long rectangle. Jean Louis Théodore Géricault (1791–1824), Sketch for The Raft of the Medusa (undated), pencil, pen and sepia on paper, 41 x 55 cm, Musée du Louvre, Paris. Wikimedia Commons. Once he had selected the second moment of peripeteia, when the survivors first sighted the Argus, he then worked through different compositional options, resulting in an initial compositional study in oils. Jean Louis Théodore Géricault (1791–1824), Study for The Raft of the Medusa (1819), oil on canvas, 36 x 48 cm, Musée du Louvre, Paris. Wikimedia Commons. He continued to develop from this, probably completing these preparations in the autumn of 1818. In this period of almost a year devoted to preparatory work, Géricault had also accumulated a great deal of information about the disaster. He had enlisted the help of another of the survivors, a carpenter, in constructing props for his studio painting. As figures resolved for inclusion in the painting, he made detailed studies of those elements in readiness for painting. 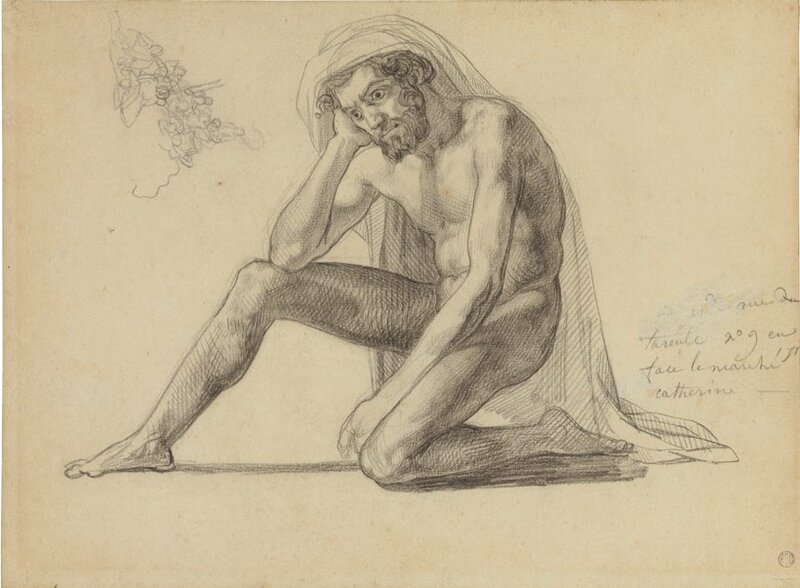 Jean Louis Théodore Géricault (1791–1824), Study for the ‘father’ figure in The Raft of the Medusa (1819), black chalk and pencil on paper, 24.4 x 34 cm, Private collection. Wikimedia Commons. This study shows one of the figures, known as “the Father”, from the group named “the Father holding his dead son”, seen below in the finished painting. 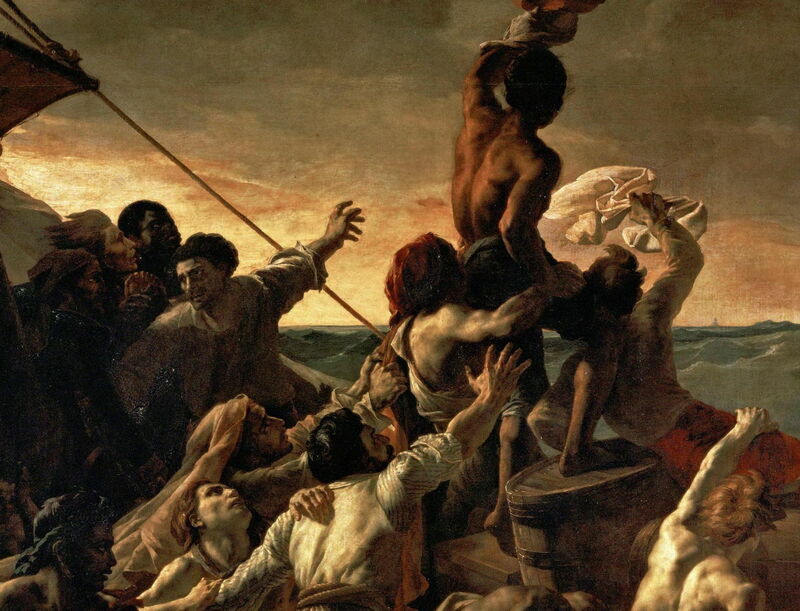 Jean Louis Théodore Géricault (1791–1824), The Raft of the Medusa (detail) (1818-19), oil on canvas, 491 x 716 cm, Musée du Louvre, Paris. Wikimedia Commons. 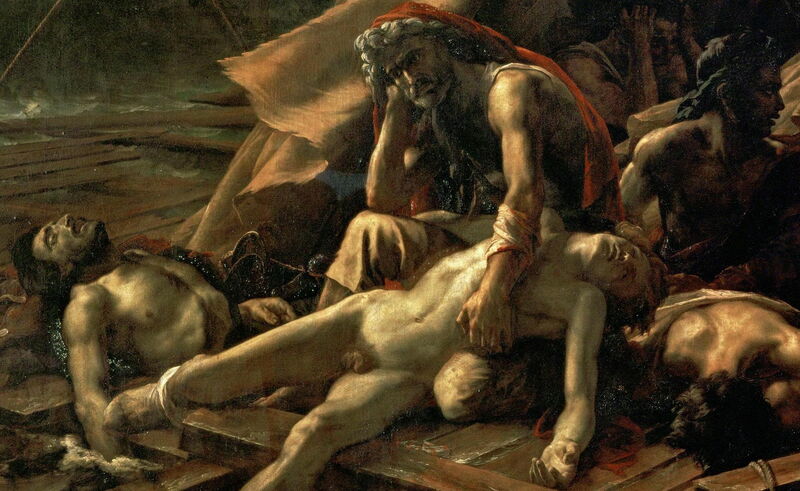 Géricault also visited morgues to make studies of cadavers and body parts. When he came to paint individual figures, he carefully selected some of sickly appearance, including the young Delacroix, who was ill with jaundice at the time. In contrast to his previous studies, though, he decided to make the Argus so tiny that this most important element in the whole composition was also its smallest. The end result was a vast canvas, its figures shown life-sized, which has had huge impact on everyone who has seen it since 1819. It appears completely authentic, and given the work that Géricault put into making it so, that is perhaps not surprising. But most gain the impression that the raft was almost square in form, as a result of the tight cropping applied, and that even with those few survivors on board, it was overcrowded. 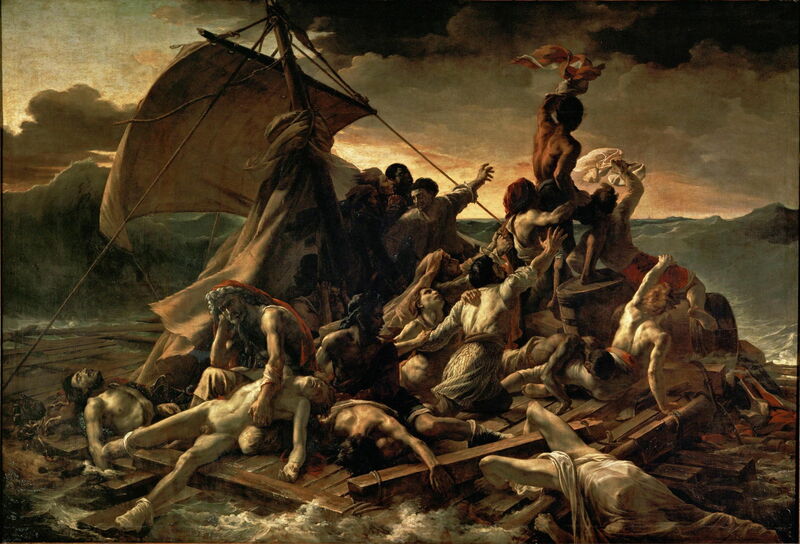 This is because Géricault chose to pack all his figures into one small section of the raft. Alexandre Corréard (1788–1857) and others, Layout of the raft of the frigate Méduse, figure in Relation complète du naufrage de la frégate La Méduse faisant partie de l’expédition du Sénégal en 1816. Wikimedia Commons. The published drawing of the plan of the raft reveals how this painting shows about a quarter of the total area of the raft as it actually was: the lowest rectangular section drawn in Savigny and Corréard’s book. Another problem was the physical state of the bodies, alive and dead, which hardly reflects thirteen days of almost complete starvation and profound dehydration. Instead Géricault opted for a well-muscled appearance more typical of life classes or classical sculpture. He may have done that in order to increase the heroic impression, rather than making the survivors look weak and pathetic. With this singular success behind him – and having created one of the greatest narrative paintings of all time – Géricault was already working on preliminary studies for further major narrative paintings on the Spanish Inquisition, and on the slave trade, when he fell terminally ill. When he died at the age of just 32, the world lost one of its most promising narrative painters. Géricault’s monumental painting shows the moment of peripeteia, and follows Alberti’s rules, with facial expressions and body language major determinants to its reading. However his close-cropped composition can give a false impression of the capacity of the raft, and he chose to show its occupants in muscular, heroic form rather than weakened and pathetic. Posted in General, Painting and tagged Géricault, narrative, painting, peripeteia, Raft of the Medusa. Bookmark the permalink. Thank you for this essay. A lot of valuable information is packed into a short, engaging text. As young artist living in Paris for a year in the 1970s, I would spend an hour with this painting at least once a month. Thank you for your kind words. I was lucky enough to visit the Louvre when they had an exhibition of his studies, etc., which was fascinating.